going on during the week. quick history behind today’s giveaway. Old Craft Store in Carrollton, Texas. They had a member’s club, similar to Sam’s or Costco. the week of your birthday. that every year would bring us a cake on her birthday. shopping spree and also she was a wonderful cook. Jelly Roll Jam pattern event happening TODAY. So with these 2 things as my inspiration. I thought I was going to give back. I am going to de-stash a true treasure. but it is in high demand. 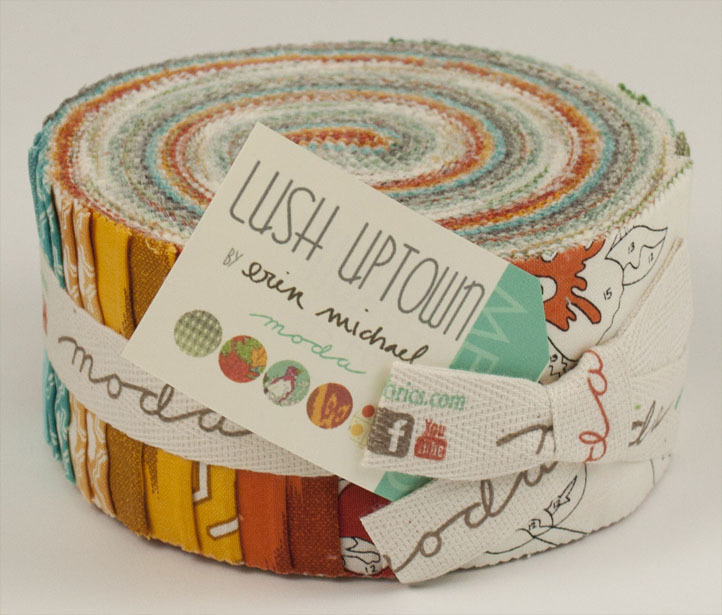 Lush Uptown by Erin Michael jelly roll. So hear is what you need to do. my post telling me if you want this jelly roll. Here is the video tutorial as well. I will post the winner of the Jelly roll Tuesday the 17th at 6:00 am. Katie said…Do I need it? NO! Do I want it? YES! Fabric, glorious fabric! Happy belated birthday and what a beautiful jelly roll!! I always enjoy Kimberly's patterns and Fat Quarter Shop and I'm off to watch this video, thanks! Happy birthday – hope you had a great time. I love jelly rolls & have downloaded the free pattern. Thanks for the giveaway. Happy belated birthday, I hope you had an enjoyable weekend celebrating! Yes, I would love to win the jelly roll, it is beautiful! Thanks for the chance! I would love a jelly roll. I haven't made anything from a jelly roll yet but would love to try the pattern. Happy Birthday, dear Lissa!!!! Hope you have a sinfully delicious CAKE for your day. Thank you so much for giving back to us for your birthday! What is not to like with any jelly roll? Take care! That would be an absolute gorgeous quilt in uptown!! TY for the giveaway. I hope you had a wonderful birthday!! I love this fabric! Of course I would love to win it!! I have been seeing the jelly roll jam all over. What a cute quilt! And so easy too. Now I just need a jelly roll! Hey COOL Lissa, Happy Belated Birthday! And I used to SHOP at Old Craft Store many years ago. Haven't been over that direction in I don't know how long. Do I really have to BARE with you?!! HAHA Yes, I'd love the jelly roll..thank you very much! Oh yes yes yes! I would love this giveaway. I love this fabric line. I hope you had a great birthday celebration this weekend. Happy belated B'day! Hope you-had a wonderful day,filled with all kinds of fun stuff!Lush uptown!!! Of course I would love to have it, win it, own it! Yeah this would be great! Belated Happy Birthday! Would love to try the quilt pattern using the jelly roll giveaway. Yes, please!!!! I would love to have that jelly roll !! Belated and heartfelt happy birthday wishes to you!! I hope you had a great day! Oh, I would love love love some Lush Uptown! I love those paint by number birds. Thanks so much for the giveaway opportunity and thanks to the Fat Quarter Shop too. It's so much fun to visit your blog! Happy birthday! I love the idea of bringing a cake to others on my birthday. I will remember that for next year. Thanks for the chance at today's giveaway. Happy Birthday! The colors of Lush are so perfect for fall, so of course I'd love to have it. Thanks for the chance! Of course I want it! Love the colors in it. The pattern looks so fast and cute, too! Thanks again for sharing. And happy belated birthday! I think it is wonderful to have a video tutorial to show how to make this quilt. Thank you for your give-away! What a fun giveaway…I just found your blog through Fat Quarter shop's post. These quilts look so fun! I would love to win the jelly roll! The fabric is beautiful!! Thank you for the chance to win!! I love this fabric and would love to do a Jelly Roll Jam quilt with it. Looks like so much fun. Yes I would love to win that jelly roll of gorgeous fabric! And the pattern looks nice too. Yes I would love to give this a good home. What a fun pattern too. YES, I do want this very much in demand fabric. It's so cool! Happy Belated Birthday, that was a nice story about the customer bringing in the cake. I love when people share sweet stories. Would love to have this jelly roll so I can try this pattern. Love it! Happy belated birthday! And yes I would love to win this jelly roll. Oh yes I want this jelly roll. I've have seen this pattern on so many blogs and every version is beautiful. Happy Belated Birthday!! Would I love this jelly roll… oh yes, I would. It would be darling worked up in the jelly roll jam!! For sure i do. On my to do list is a 9 patch star quilt. Happy late birthday! Goodness I am late to this party! This is one of those collections I didn't realize I loved until it was too late! I did manage to snag some of the paint box prints at least…but a jelly roll would be wonderful! Oh my, Lissa, do you really need to ask? I am hoarding my few pieces of the original line, and I would love to add something of the new one to it. So cool! Do I want it, you betcha! I'd love to make a jelly roll jam quilt. Absolutely want this! I'm completing my very first quilt so my stash is non-existent thus far. This would be a great beginning for me. AND, I actually pinned the video of this quilt yesterday. Lisa, you always keep me drooling for more! YES I would like the Uptown Jelly Roll for sewing fun! I WANT THIS JELLY ROLL!!!! Happy bday! Id love this jelly roll! There are two babies coming this month so it would be perfect! I so badly want ths jelly roll to make this quilt..looks yummy fabric. I've never used a jelly roll so this would be something new for me to try. Yes, please, then I can make a Jelly Roll Jam quilt to donate to Bumble Beans Basic "The Retreat" charity. Thank you for the chance to win.